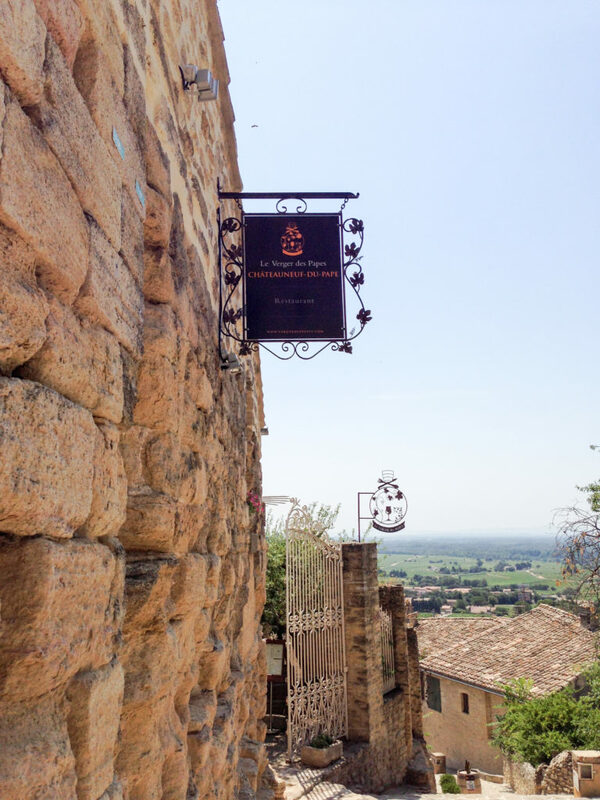 Located at the foot of the famous Châteauneuf-du-Pape (at least the remains of what was then the new chateau for the pope), Le Verger des Papes is a most pleasurable experience – for all your senses. Photo by Gloria J. Chang. I can’t say I remember what I actually ate during the glorious lunch I had here. All I remember was that the food was delicious, the company convivial, and the view fabulous. I remember the feeling: not wanting to be anywhere else, not wanting to leave just yet for my next vineyard and winery visit. I remember my thinking: how quintessential southern France the whole experience was, this lovely provençal restaurant outdoors. And I remember the view: the varying shades of summer green in the distance, the orange tiled roofs of the buildings of the town of Châteauneuf-du-Pape in the foreground. The olive tree. It’s also where you might rub shoulders with winemakers of the region, as I did, running into the producer I’d met and tasted with that morning. This man in the years when his hair and beard were already turning white and his father. This man introducing me to him, looking at him as if only a boy of ten. The admiration. The awe. This man who so expertly maneouvred us his vineyards filled with the large rocks Châtteauneuf-du-Pape was famous for. The smooth, large rocks were so large and slippery, I thought we would surely tip over in his old 4 by 4 as we slid on them until the very last second of the sharp turns, the jeep would right itself again. This is the kind of place where memories are made. Reservations recommended at this 1 star Michelin restaurant.